A popular Eastertide event in Colorado has been cancelled this year after the event's organizers say it's gotten dangerous for participants. The rough-and-tumble, no-holds-barred, collarbone-snapping competition was a neighborhood egg hunt, and the parties to blame for turning it from a sweet holiday tradition involving children's laughter and fun into Easter: Beyond Thunderdome were't poorly behaved children, but rather the adults who insisted on shovey with each other. Because parents have never met a kids-only event they can't ruin. Last year's Colorado Springs, Colorado egg hunt was a study in manic overparenting as hundreds of kids and parents showed up at the edge of a small park for the event. Organizers say there wasn't sufficient space to hide the prizes, and thus the lawn was dotted with visible eggs, which were apparently enough to make the parents' "kill" instincts kick in and drive them positively mad with prize-lust. To make matters worse, the bullhorn starting gun malfunctioned, which means that as the parents lined up behind the starting line like Olympic sprinters, confused pursechildren in tow, the smallest flinch of out-of-the ordinary noise caused them to barrel en masse across the starting line toward the eggs, leaving the snoozers behind to do what snoozers do best, which is lose. Parents went after eggs like a New Orleans defensive back goes after knees, and the proceedings were over in seconds. Like a carcass that had been picked clean by a pack of pirañas, the lawn was empty, desolate and dotted with shell-shocked, weeping casualties. It wasn't like the eggs were stuffed full of heavily rationed antibiotics that cure zombie diseases or vouchers good for free tuition at their child's future college of choice, either; the plastic shells were filled with candy or coupons for local businesses. This Coupon Entitles The Bearer to One Free Dignity. While Supplies Last. 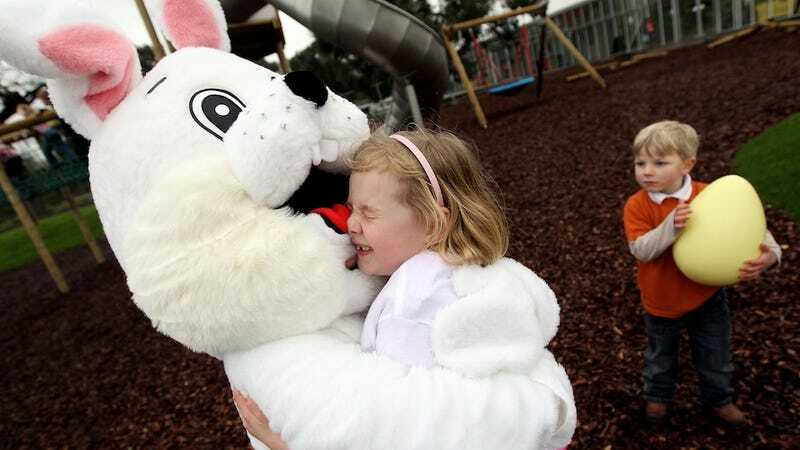 The pushing and shoving and helicopter parenting was too much for organizers, and so rather than limit parental involvement in this year's egg hunt, they've just scrapped the event altogether. Guess Colorado Springs parents will just have to shove each other out of the way and teach their kids about getting parents to solve all their problems for them on their own time.